Where necessary, an asterisk indicates the contributing author who is a member of SIL. Drafts of two manuals (in Spanish) to help with glossing texts using FLEx have been posted under the Training tab (http://www.mexico.sil.org/training). Seri — "La creación del mundo: análisis de un antiguo canto seri"
A paper by *Stephen A. Marlett, René Montaño Herrera and E. Fernando Nava L. in the journal Tlalocan, published at UNAM in Mexico City. An ancient Seri song is presented along with a comparison of eight variations of the text that have been recorded, and a discussion of the meaning of the sung version of a creation myth. A version of the content in narrative form is also given, as well as a proposal for the correspondence between the sung version and the oral version of the text. The narrative version is presented with morpheme division, glosses and with reference for each word to its respective entry in a Seri dictionary. A musical transcription of the song is included, and an explanation of the relationship between the text and the music. and an explanation of the relationship between the text and the music. A book compiled by Marjorie J. Buck. This grammar of the Amuzgo language uses relatively non-technical terminology to describe the variety that is spoken in the region of Xochistlahuaca, Guerrero. Topics covered include the parts of speech. The descriptions are illustrated by analyzed phrases and sentences. In addition, there are three analyzed texts. Also included is a bibliography and a map. Me'phaa —"The sounds of Me'phaa (Tlapanec): A new assessment"
A paper by Stephen A. Marlett and Mark L. Weathers. This paper presents an assessment of the complexities of the sounds of the Meꞌphaa (Tlapanecan) genus, a cluster of closely related language varieties spoken in southern Mexico that form a separate branch of the large Otomanguean family. Various facts present analytical challenges; these are discussed in detail. The content of this book was developed to help native speaker writers become better prepared to write and publish material in their own languages. See the link on the new page for training on this website where similar materials will be posted. 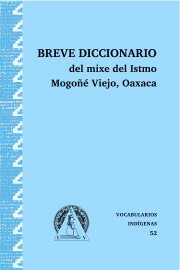 This bilingual dictionary includes many of the most common words in the Isthmus Mixe language (Oaxaca). The entries in both the Mixe–Spanish and Spanish–Mixe sections include parts of speech and translation equivalents with different senses. There are also illustrative sentences in the Mixe–Spanish section. Tlacoapa Mi'phaa — "Propuesta de convenciones para escribir el mi'phaa de Tlacoapa"
A working paper by Stephen A. Marlett. This work summarizes basic conventions that are in use for writing Mi'phaa (Me'phaa, Tlapanec) of Tlacoapa, Guerrero (ISO 639-3 code = tpl). Mazatlán Villa de Flores Mazatec — "ꞌIen Nájndi̱̱a̱, el mazateco de Mazatlán Villa de Flores"
A paper by *Ryan David Klint and Israel Filio García. This description presents a new and detailed analysis of the sounds of Mazatec as they are attested in Mazatlán Villa de Flores, Oaxaca. It is accompanied by recordings. 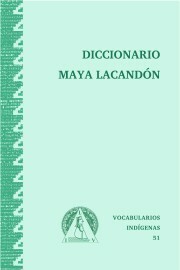 Lacandón — "Diccionario maya lacandón"
A book compiled by Mary and Phillip Baer. This bilingual dictionary includes the majority of the most common words in the Maya Lacandón language (Chiapas). The entries in both the Lacandón–Spanish and Spanish–Lacandón sections include parts of speech, translation equivalents with different senses, and subentries for derived forms. The Lacandón–Spanish section has illustrative sentences. The appendices contain phonological notes and a grammar sketch of Lacandón. San Jerónimo Tecóatl Mazatec — "Propuesta de convenciones para escribir el mazateco de San Jerónimo Tecóatl"
A working paper by Daniel Agee and Margaret Agee. This work summarizes basic conventions that are in use for writing San Jerónimo Tecóatl Mazatec (ISO 639-3 code = maa). Eloxochitlán Mazatec — "Propuesta de convenciones para escribir el mazateco de Eloxochitlán"
A working paper by Daniel Agee and Margaret Agee. This work summarizes basic conventions that are in use for writing Eloxochitlán Mazatec (ISO 639-3 code = maa). Comaltepec Zapotec — "Propuesta de convenciones para escribir el zapoteco de Comaltepec "
A working paper by Larry Lyman. This work summarizes basic conventions that are in use for writing Comaltepec Zapotec (ISO 639-3 code = zpc). A book by Judi Lynn Anderson. This grammar of the Chinantec language uses relatively simple terminology to describe the variety that is spoken in the town of Santiago Comaltepec, Oaxaca. Topics covered include the parts of speech. The descriptions are illustrated by analyzed phrases and sentences. In addition, one chapter contains eight analyzed texts. Also included is a bibliography and a map. Southwestern Tlaxiaco Mixtec — "Propuesta de convenciones para escribir el mixteco del suroeste del distrito de Tlaxiaco"
A working paper by Larry Harris and Mary Harris. This work summarizes the basic conventions that are in use for writing Southwestern Tlaxiaco Mixtec (ISO code 639-3 = meh). The purpose of this paper, edited by Heather Beal, is to preserve and provide access to a group of indigenous language essays which afford both cultural insights and linguistic information. These essays were written by various authors for use on a calendar published by ILV (Agee 2016).. This article contains one additional essay that was collected for this purpose but not included in the published calendar. This is an updated version of the bibliography compliled by Stephen A. Marlett. Mixtec — "Los pronombres personales del mixteco: Un estudio comparativo entre dos variantes lingüísticas"
A paper by Ada Rázuri, published in Lengua y Sociedad. The personal pronouns of two varieties of Mixtec are described: San Bartolomé Yucuañe and Magdalena Peñasco, both located in the district of Tlaxiaco, state of Oaxaca. The ways in which the two varieties classify the pronouns are different. The first codifies factors such as gender, age and proximity to the speaker and hearer. The second, on the other hand, only emphasizes respect towards the hearer. Tlachichilco Tepehua — "Tlachichilco Tepehua: Semantics and function of verb valency change"
An article by James K. Watters, in Verb valency changes: Theoretical and typological perspectives, edited by Albert Álvarez González and Ía Navarro (John Benjamins), pp. 165-192. Tlachichilco Tepehua, like other Tepehua and Totonacan languages, has a rich system of morphology that modifies verb valency. There are five constructions that affect core arguments of the verb: the dative and causative and the four valency-decreasing constructions ─ passive, antipassive, body-part incorporation, and the decausative. These morphological processes typically affect inherent aspect and lexical semantics or facilitate tracking referents in discourse. The three applicative prefixes, and, in some cases, the dative suffix, license non-core arguments which function as direct arguments of the verb. Syntactically, the applicatives allow non-core arguments to be questioned or relativized. Semantically, their arguments manifest roles that are frame-internal ─ determined by the scene associated with the base verb ─ or frame-external, such as the benefactive. Seri — "A panorama of valency changing operations in Seri"
An article by Stephen A. Marlett, in Verb valency changes: Theoretical and typological perspectives, edited by Albert Álvarez González and Ía Navarro (John Benjamins), pp. 193-226. The Seri language displays several valency changing operations, most of which are robustly attested and used. is paper presents a panorama of these oper- ations. Evidence from the morphology, sensitive as it is to transitivity, helps in the consideration of possible analyses. Some of the operations, such as passive, unspeci ed subject, antipassive (implicit argument type) and causative, are straightforward in their respective analyses, as well as being common cross-linguistically. Other operations, including the impersonal passive of transitive verbs, the age construction, the times construction and the Experiencer subject construction, do not have counterparts in many other languages. Tepehua — "Spanish influence in two Tepehua languages: Structure-preserving, structure-changing, and structure-preferring effects"
An article by James K. Watters, in Language contact and change in Mesoamerica and beyond, edited by Karen Dakin, Claudia Parodi and Natalie Operstein (John Benjamins), pp. 30-54. The kinds of change brought about by Spanish influence on two Tepehua (Totonacan) languages are of three types: structure-preserving change, including borrowing of all word classes; structure-changing processes in the phonology; and the structure-preferring influence of Spanish in progressive and applicative constructions. Nonfinite verb forms and other borrowed lexical items fit within existing structures. Changes in the phonology include loss of phonemic contrast as well as change from a three-vowel to a five-vowel system. Contact has also given some preference to the periphrastic form of the progressive, and prepositional phrases over applicatives. The features characterizing Spanish influence vary widely across the generations, reflecting growing bilingualism and interference from code switching. Meꞌphaa — "The effect of external factors on the perception of sounds in Me'phaa"
An article by Stephen A. Marlett, in Language contact and change in Mesoamerica and beyond, edited by Karen Dakin, Claudia Parodi and Natalie Operstein (John Benjamins), pp. 82-104. The Meꞌphaa (Tlapanec) language genus, which displays some interesting internal diversification, has been in contact with other languages of southern Mexico, including those with which it is not genetically related, and with Spanish. This chapter examines various specific areas of the phonology of Meꞌphaa and discusses different factors – both internal to the genus and external – that seem to be affecting how the sounds of the language are perceived by the speakers of the language today. The primary evidence is based on the on-going development of an alphabetic representation of the language. The discussion of these facts leads to a new assessment of the value of traditional methods, based on a closed corpus, for analyzing the sound system of a language. The effects of external factors need to be taken into consideration. A book compiled by Judith F. de Williams [Judith Williams]. 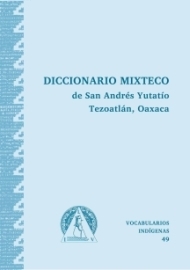 This bilingual dictionary includes the majority of the most common words in the Tezoatlán Mixtec language (San Andrés Yutatío, Oaxaca, Mexico). The entries in both the Mixtec–Spanish and Spanish–Mixtec sections include parts of speech, translation equivalents with different senses and subentries for derived forms. There are also illustrative sentences in the Mixtec–Spanish section. A book (in two volumes) compiled by Elena Erickson de Hollenbach [Barbara E. Hollenbach]. 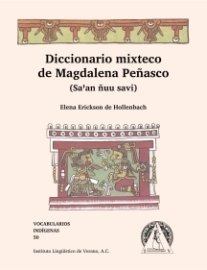 This bilingual dictionary includes the majority of the most common words in the Mixtec language of Magdalena Peñasco (Oaxaca, Mexico). The entries in both the Mixtec–Spanish and Spanish–Mixtec sections include parts of speech, different senses, and subentries for derived forms. There are also illustrative sentences in the Mixtec–Spanish section. Following the body of the dictionary, there are several appendices that treat particular semantic domains: numbers, colors, kinship terms, place names, and parts of the body, etc. Also included are ninety-one verb conjugations. San Juan Lealao Chinantec — "Propuesta de convenciones para escribir el chinanteco de San Juan Lealao"
A working paper by James Rupp. This work summarizes the basic conventions that are in use for writing San Juan Lealao Chinantec (ISO code 639-3 = cle). "La preparación y publicación de textos como parte de la documentación de una lengua"
A working paper by Stephen Marlett. This paper describes different ways of presenting language texts for publication, with translation and analyisis. Although the examples are drawn from presentations of texts of indigenous languages of Mexico, the paper is pertinent to investigators working in other parts of the world as well. "Discourse analysis and information structure studies of Otomanguean languages: An annotated bibliography"
A working paper by Stephen Marlett. This paper presents an annotated bibliography of studies about discourse analysis or information structure of languages in various branches of the Otomanguean language family. It is organized around the topics presented in Dooley & Levinsohn (2001). Ozumacín Chinantec — "Propuesta de convenciones para escribir el chinanteco de Ozumacín"
A working paper by James Rupp. This work summarizes the basic conventions that are in use for writing Ozumacín Chinantec (ISO code 639-3 = chz). Quioquitani Zapotec — "Propuesta de convenciones para escribir el zapoteco de Quioquitani"
A working paper by Michael Ward. This work summarizes the basic conventions that are in use for writing Quioquitani Zapotec (ISO code 639-3 = ztq). Edited Spanish-language version of a paper by Edward W. Moser originally published in The Kiva in 1963. In previous publications about the Seris, frequent references to distinct groups of Seris indicated the existence of historic tribal divisions on some level. Investigation by Moser among the Seris determined the previous existence of six bands, which included three dialectal groups. Three of the bands were subdivided in clans. These six bands, whose formation could have been caused principally by internal conflicts, eventually were crushed and reduced to one single group by means of destruction caused by external conflicts. Seri — "Propuesta de convenciones para escribir la lengua seri (cmiique iitom)"
A working paper by Stephen A. Marlett. This work summarizes the basic conventions that are in use for writing Seri (ISO code 639-3 = sei). Tepehua — "Verb-verb compounds and argument structure in Tepehua"
A paper by James K. Watters published in Argument realisation in complex predicates and complex events: Verb-verb constructions at the syntax-semantic interface edited by Brian Nolan and Elke Diedrichsen. In Tepehua (Totonacan, Mexico), verb-verb constructions are of two kinds: verb-verb compounds and verb-as-operator constructions. In verb-verb compounds, the second verb is the head of the construction and the two verbs may or may not be separated by inflection. These compounds parallel adverb-incorporation constructions and are subject to a constraint: if the first verb is transitive, the second verb must also be formally transitive, even if its semantic contribution is intransitive. Beyond this transitivity constraint, verb selection is only restricted by pragmatics. In the verb-as-operator constructions, the head verb is the first member of the construction, the modifying verb is a member of a closed class, and it may not be separated from the head verb by inflection. In some instances, the second verb functions as an operator specifying aspect or position. The complex predicate construction has made it possible for what was historically a verb root, tʃuqu, to become a very common productive suffix in Tepehua. A calendar for 2017 compiled by Peggy Agee. Each month is accompanied by an illustration of an insect common to Mexico and a short text in an indigenous Mexican language, with Spanish translation, about that insect. Alacatlatzala Mixtec — "Propuesta de convenciones para escribir el mixteco de Alacatlatzala"
A working paper by Lynn Anderson C. and Carol F. Zylstra. This work summarizes the basic conventions that are in use for writing Alacatlatzala Mixtec. Comaltepec Chinantec — "Flexible animacy in Comaltepec Chinantec"
A working paper by Judith Lynn Anderson and Cheryl A. Black. This paper describes how animacy is normally marked in Comaltepec Chinantec and how this animacy marking may change when the speaker wishes to express either a closer or more distant relationship with the referent. A book compiled by Laura Gittlen. This grammar describes the Northern Tlaxiaco Mixtec language, a variety of Mixtec that is spoken in Oaxaca, Mexico. Relatively non-technical terminology and illustrations are used to make grammatical concepts more understandable. Grammar is explained through contextualization, repeating the apt cultural metaphor of the human body and its parts, which are used in the language for locations. The chapters are organized according to the order of the three main parts of a simple sentence: the verb phrase, subject, and complements. Topics covered include parts of speech and various kinds of sentences, all of which are accompanied by interlinearized examples. The final chapter contains an analyzed text. The appendices provide information about the sounds of the language; movement, carrying and position verbs; derivational affixes; verbal aspect, number and tense; pronouns; and numbers and measures. A book compiled by Joseph P. Benton. This bilingual vocabulary includes the majority of the most common words in the San Juan Coatecas Altas Zapotec language (Oaxaca, Mexico). The entries in both the Zapotec–Spanish and Spanish–Zapotec sections include parts of speech, translation equivalents with different senses and subentries for derived forms. The Zapotec–Spanish section also includes a few illustrative sentences. Following the body of the vocabulary there are notes about the grammar. A book compiled by Joseph P. Benton. This bilingual vocabulary includes the majority of the most common words in the San Baltazar Chichicápam Zapotec language (Oaxaca, Mexico). The entries in both the Zapotec–Spanish and Spanish–Zapotec sections include parts of speech, translation equivalents with different senses and subentries for derived forms. The Zapotec–Spanish section also includes a few illustrative sentences. Following the body of the vocabulary there are notes about the grammar. Seri — "Federico Craveri and changes in nesting seabirds on Isla Rasa, Gulf of California, since 1856"
An article by Thomas Bowen, Enriqueta Velarde, Daniel W. Anderson, & *Stephen A. Marlett. Isla Rasa in the Gulf of California has been recognized as an important seabird breeding island for more than 150 years. Yet during most of this period, the island suffered human disturbances that severely reduced seabird nesting success. Today, nearly two decades after disturbances ended, Isla Rasa supports about 90% of the global populations of Heermann’s gulls (Larus heermanni) and elegant terns (Thalasseus elegans), plus smaller populations of other species. However, the recently available 1856 journals of Italian naturalist Federico Craveri, and the oral traditions of the Comcaac (Seri people), suggest that the array of nesting species has changed. Apparently, California brown pelicans (Pelecanus occidentalis californicus) abandoned Isla Rasa as a breeding site at the onset of disturbances, and terns first colonized it around 1920. Seri — "The Trooqui Treen: A Seri truck"
An article by Cathy Marlett in Journal of the Southwest 57: 199–212. The story of a unique truck that was given to and operated by people in the Seri community for a short while in the 1920's is told and connected to the changes that were taking place at that time. Mixtec — "Pareados y difrasismos verbales en mixteco de Diuxi-Tilantongo"
A working paper by Albertha Kuiper. A description of the grammatical structure and the uses of verbal parallelisms and doublets in Diuxi-Tilantongo Mixtec. Most are used to make discourse more formal and elegant. Many examples are given. Seri — "Seri origin myth"
A working paper by Roberto Herrera Marcos & *Edward W. Moser, edited by *Stephen A. Marlett. It is a previously unpublished summary of one "typical version" of the Seri origin myth. Seri — "Two annotated short Seri texts"
A working paper by Stephen A. Marlett. It presents a community-based orthographic transcription in Seri of two short texts with interlinear glosses and free translations in English and Spanish. The texts are extensively annotated to point out interesting lexical and grammatical features of the language. Seri — "A typological overview of the Seri language"
A chapter by Stephen A. Marlett. This is an updated version of a previously published paper (2005), now appearing in Stefan Georg, ed., Language Isolates, vol. 4 (London: Routledge Press), ISBN 9780415827348. This is a calendar with a photograph of a different mollusk for each month and a text in Seri and Spanish of Seri knowledge and folklore about each mollusk. Various young people contributed the interesting essays. Seri — "Doce moluscos en doce meses / Twelve mollusks in twelve months"
A working paper edited by Stephen A. Marlett. The essays in the 2015 calendar are presented with Spanish and English translations. Mazatec — "Tense-aspect formation in Mazatec (in Jalapa de Díaz, Oaxaca)"
A working paper by H. Andrew Black & Judith L. Schram. This paper focuses on the formation of the six tense-aspects for simple (i.e. non-compounded) verbs of the Jalapa de Díaz variety of Mazatec. Popoloca — "Los pronombres en ngigua"
A working paper by Sara Stark C. [Sharon L. Stark]. This is a Spanish translation of the 2011 working paper that is a description of the Tlacoyalco Popoloca pronominal system. The focus is on the richness of third person pronoun forms, specifically how any noun without an existing pronominal form can be used as a pronoun by removing the stress. Seri — "La semántica léxica contrastiva y los diccionarios bilingües"
A working paper by Stephen A. Marlett. This paper, which is part of the Zapotec Grammar Files series, describes syntactic constructions that are used to indicate possession in various varieties of Zapotec. A book compiled by Elizabeth R. Willett & Thomas L. Willett. 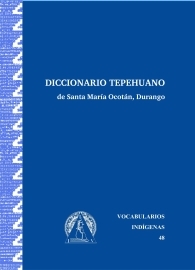 This bilingual dictionary (with approximately 3700 entries) includes the majority of the most common words in the Southeastern Tepehuan language as spoken in Santa María Ocotán, Durango. The entries in both the Tepehuan–Spanish and Spanish–Tepehuan sections include parts of speech, translation equivalents with different senses and subentries for derived forms. There are also illustrative sentences in the Tepehuan–Spanish section. Following the body of the dictionary, there is a grammar section (90 pages) and appendices that provide focus on particular semantic domains: kinship terms, parts of the human body, the number system, names for certain sounds, place names and tongue-twisters. Tepehua — "Transitivity, constructions, and the projection of argument structure in RRG"
A chapter by James K. Watters that appears in Brian Nolan & Elke Diedrichsen, eds., Linking Constructions into Functional Linguistics: The Role of Constructions in Grammar (Amsterdam: John Benjamins), ISBN 9789027206121. Traditional “projectionist” accounts of transitivity project the argument structure of a clause from the head verb. Some studies within Construction Grammar have shown this does not account for cases in which syntactic frames override a verb’s inherent transitivity, arguing instead that transitivity is determined by the syntactic construction. Such examples typically come from English and related languages in which many or most verbs freely occur in transitive or intransitive frames without any overt derivational morphology. However, in languages such as Tepehua (Totonacan), verbs have rigidly specified transitivity, with no such overriding of argument structure. Role and Reference Grammar treats argument structure as a projection from the composite logical structure, accounting for clause structure in both types of languages. This is a calendar that illustrates the significance of plants in the Tlapanec (Meꞌphaa) language and culture. Each month features a photograph of a different type of plant and a text about the category of plant or the plant. Various authors contributed the beautiful essays, which are written in several varieties of Me'phaa and are translated into Spanish. Tlapanec — "Meꞌpaa de Acatepec"
A preliminary phonological description of Me'paa de Acatepec by *Stephen A. Marlett & Plácido Neri Remigio. Includes sound recordings of examples (in a separate zip file). A book by Elena Erickson de Hollenbach [Barbara E. Hollenbach]. This grammar uses relatively non-technical terminology to describe the variety of Mixtec that is spoken in the town of Santa María Magdalena Peñasco, district of Tlaxiaco, Oaxaca. Topics covered include all the parts of speech, but especially the verbs. The descriptions are illustrated by analyzed phrases and sentences. In addition, there is a description of the phrase and sentence structure of the language. The final chapter contains four analyzed texts. One appendix provides information about the use of doublets, which are juxtaposed pairs of synonyms or other words that are closely related semantically used to augment the rhetorical effect. Another appendix contains information about greetings. A dissertation by Inga McKendry at the University of Edinburgh about prosodic topics in Mixtec. A book by Carol Zylstra. This grammar uses relatively non-technical terminology to describe the variety of Mixtec that is spoken in the town of Alacatlatzala, municipality of Malinaltepec, Guerrero. Topics covered include the parts of speech and phrase, sentence and discourse structure. The descriptions are illustrated by analyzed phrases and sentences. An appendix provides information about tonal changes involving pronouns. Seri — "How the blue bottlefly makes smoke: on the presentation of a Seri text"
An article by Stephen A. Marlett that appeared in Tlalocan. The text that it discusses was first published by Edward W. Moser in 1968 and has been edited and used in various community-oriented publications. Seri — "The minimal word in Seri"
A working paper by Stephen A. Marlett published in Work Papers of the Summer Institute of Linguistics, University of North Dakota, Vol. 53. Data are presented in support of the claim that the minimal word and minimal root in Seri must be bimoraic. The bimoraicity condition may be met by rhymes that are heavy in more than one way. Zapotec — "Location as subject in Yalálag Zapotec"
A paper by Ronald Newberg published in Expressing location in Zapotec, Studies in Native American Linguistics 61, edited by Brook Danielle Lillehaugen and Aaron Huey Sonnenschein. This paper describes grammatical constructions involving positional verbs in Yalálag Zapotec, with focus on a particular construction (known as “hosting”) in which the semantic ground (location) is realized as the grammatical subject. 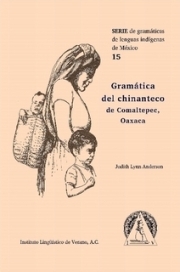 Zapotec — "The grammaticalization of body part terms in two varieties of Zapotec"
A paper by Joseph P. Benton published in Expressing location in Zapotec, Studies in Native American Linguistics 61, edited by Brook Danielle Lillehaugen and Aaron Huey Sonnenschein. This article describes how body part terms in both Chichicapan and Coatecas Atlas Zapotec have become grammaticalized to function as prepositions. There is special focus on the uses for the term 'face'. Zapotec — "Location and position in Comaltepec Zapotec: Some aspects of Comaltepec Zapotec locative adverbs, demonstrative adjectives, and body part prepositions"
A paper by Larry G. Lyman published in Expressing location in Zapotec, Studies in Native American Linguistics 61, edited by Brook Danielle Lillehaugen and Aaron Huey Sonnenschein. This paper describes different locative and temporal constructions in Comaltepec Zapotec, particularly those involving locative adverbs, demonstrative adjectives, and body parts terms functioning as locative prepositions. Zapotec — "The existential use of positional verbs in Texmelucan Zapotec"
A paper by Charles H. Speck published in Expressing location in Zapotec, Studies in Native American Linguistics 61, edited by Brook Danielle Lillehaugen and Aaron Huey Sonnenschein. This article explores the syntax of clauses involving positional verbs being used with an existential meaning. The results are compared with what is known about existential verbs universally. Zapotec — "Body part terms and their uses in Quiegolani Zapotec"
A paper by Cheryl A. Black published in Expressing location in Zapotec, Studies in Native American Linguistics 61, edited by Brook Danielle Lillehaugen and Aaron Huey Sonnenschein. This paper documents various uses of body part terms in Quiegolani Zapotec. In addition to being names of body parts, these terms can be used in other grammatical constructions (e.g. in a prepositional sense in locative constructions). A volume compiled by James E. Rupp. This bilingual dictionary (with approximately 2000 entries) includes many of the most common words in the Ozumacín Chinantec language. The entries in both the Chinantec–Spanish and Spanish–Chinantec sections include parts of speech, translation equivalents with different senses and subentries for derived forms. A short grammar (40 pages) follows the body of the dictionary. Mixtec — "El parangón en San Juan Mixtepec, Juxtlahuaca: El día de la boda y el día del cambio de autoridades"
A working paper by María M. Nieves. This study presentes the Ceremonial Speech used in the Mixtec town of San Juan Mixtepec, Oaxaca. Ceremonial Speech is a discourse uttered by an old man who acts as an ambassador or representative in certain civic or religious activities like weddings, baptisms, and the changing-over of the municipal authorities of the village, among others. The special speech genre used in this type of discourse is part of Mixtec rhetoric; in addition to figures of speech, it is characterized by some poetic devices like parallelisms and word pairs in parallel lines. Today, this form of expression is kept alive in San Juan Mixtepec, demonstrating the richness of this ancient language. Mixtec — "Algunos dichos y creencias tradicionales de Magdalena Peñasco"
A paper by Elena Erickson de Hollenbach [Barbara E. Hollenbach]. This study presents some traditional beliefs found in the Mixtec town of Magdalena Peñasco, Oaxaca. Some refer to omens that foretell the weather or even death. Others refer to actions that give a way to remedy some condition or that are taboo because of their unfavorable consequences. The study also includes a number of traditional sayings; some give wise counsel for living, and others are used to make children obey, or to comment on people's luck or fate. Each section has a brief explanation of the belief, and many times one or more Mixtec versions are included with a translation into Spanish. When an animal or plant is referenced, the Mixtec name is given in parentheses. Seri — "Relative clauses in Seri"
A chapter by *Stephen A. Marlett in Bernard Comrie & Zarina Estrada-Fernández (eds. ), Relative clauses in languages of the Americas: A typological overview, Amsterdam: John Benjamins. This chapter presents the basic facts about relative clauses in Seri, including their morphology (as nominalizations), syntax (head-internal), and distribution in discourse (relatively infrequent). The heads of intransitive relatives may be formally marked as definite when the content of the relative is being emphasized. Ambiguity is avoided in transitive relatives by the omission of the definite article on the head. While some kinds of recursion of relative clauses are possible, others are not. Throughout this presentation, relative clauses are distinguished from formally identical but pragmatically distinct constructions in the language. Three Seri authors (Lorenzo Herrera Casanova, Francisco Xavier Moreno Herrera, and René Montaño Herrera) contributed written essays to the volume edited by David L. Kozak entitled Inside Dazzling Mountains: Southwest Native Verbal Arts. published by the University of Nebraska Press (ISBN 9780803215757). *Stephen A. Marlett provided translations into English. Otomi — "Los pueblos indígenas de Hidalgo"
Invited contribution by *Doris Bartholomew. In Lourdes Báez Cubero et al. (eds. ), Los pueblos indígenas de Hidalgo: Atlas etnográfico, pages 64-68. México, D.F. : Instituto Nacional de Antropología e Historia. It presents a very concise history of the documentation of Otomian languages from the 16th century to the present. Otomi — "Ran yogipêntβᵭ, “el águila sagrada”: en yuhú y español"
Invited contribution by Artemisa Echegoyen & Katherine Voigtlander. In Lourdes Báez Cubero et al. (eds. ), Los pueblos indígenas de Hidalgo: Atlas etnográfico, pages 90-92. México, D.F. : Instituto Nacional de Antropología e Historia. It presents a short Sierra Otomi text that was recorded in 1975; the narrator also collaborated in the transcription and translation.